Transcription of Obituary in the Primitive Methodist Magazine by V.J. Ann Vaughan, the beloved wife of the Rev. John Vaughan, was the seventh child of George and Elizabeth Cunliffe, who for many years were honoured members of our Church. Mrs. Vaughan was born at Hollinbank, Helmshore, Lancashire, on the 4th of February, 1842, and died at her residence, South Shore, Blackpool, on Wednesday, March 16th, 1904, aged sixty-two years. When very young she attended Hollinbank Primitive Methodist Sunday School, the late James Whitaker, Esq., being the superintendent. And it was here the first serious impressions were made upon her young and tender heart. In the school hung the picture of an eye, with the words, “Thou God seest me,” painted over it, and the impressions made upon her mind at the sight of that eye, followed her all through life. Before she was ten she met in her father’s class, and was reckoned a member as soon as she was old enough. And from that time, to the day of her death, she had the welfare of the Connexion at heart. At all times she was true to her conscience and her God. When quite young she was a member of the Band of Hope, and finding that her teacher was a tippler, and in the habit of spending a portion of his time in a drink shop, she, with the rest of her class-mates, refused to be taught by him. And all through life this standing up for God, and truth, and right, characterised her conduct. In June, 1868, she was united in marriage to the Rev. John Vaughan, who is now left to mourn his loss. For nearly thirty-six years the union was a very happy one. As a wife, Mrs. Vaughan was most devoted, and as a helpmeet she was most zealous. Her sunny looks and kind words made her a welcome visitor everywhere, especially among the sick and poor. Her work in Church consisted mostly in class-leading and Sunday School teaching. At street services, and processions, and at prayer-meetings, and camp-meetings, she was in her element. She was also particularly useful in organising bazaars, by which, in some cases, large sums were raised for church purposes. At the Conference of 1895, after thirty-eight years in the active work of the ministry, and in consequence of advancing years and failing health, Mr. Vaughan was obliged to seek superannuation. 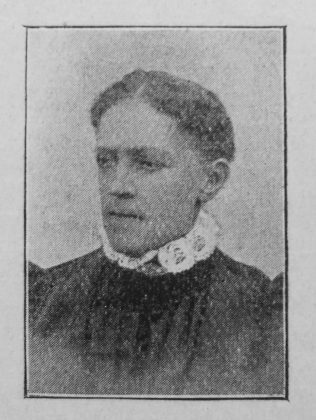 In July of that year, they took up their residence as South Shore, Blackpool, from whence, after four days illness with pneumonia in both lungs, and in spite of all that could be done to save her, Mrs. Vaughan passed away at 5 p.m. on Wednesday, March 16th, 1904. She was quite sensible to the last, gave her sorrowing husband all instructions about her funeral, etc., and left a bright testimony that she was going to be for ever with the Lord. The interment took place at the Blackpool Cemetery, in the presence of a large number of sympathising friends, on Monday, March 21st, 1904: the Rev. J. D. Thompson, assisted by the Rev. Frank Vaughan (nephew), being the officiating ministers. Her death was improved on the following Sunday evening, in the hearing of a large congregation in Chapel Street Chapel, Blackpool, when a powerful sermon was preached by the Rev. Nathan Haigh, of Stoke-on-Trent. Mrs. Vaughan was widely known and highly respected by at large circle of friends outside her own church, and the numerous letters received by her bereft husband, have been comforting and consoling. Ann was born to parents George, a fulling miller, and Elizabeth. Ann married John Vaughan (1831-1907) in the summer of 1868 in the Haslingden Registration District, Lancashire.